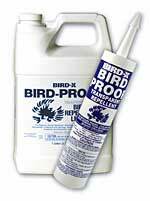 Bird-X's Bird-Proof repellent is engineered to discourage birds from alighting and nesting on it for up to a year or more, even under extreme weather. The chemical compound has a tacky, uncomfortable feeling that birds avoid. It is odorless, non-poisonous, and available as a gel that is applied with a standard caulking gun or as a liquid that is applied with a pressure sprayer or paint brush. 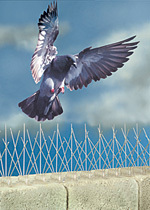 Bird-X's BroadBand PRO targets pest birds with four different sound combinations, including distress cries to indicate danger to pigeons, starlings, gulls, and more; predator cries such as falcons and hawks; general harassments for an all-bird defense; and ultrasonic waves to guard day and night. The device is ideal anywhere birds congregate, such as rooftops and parking lots. Bird-B-Gone's Bird Spike 2007 is a stainless steel spike for building maintenance that is designed to be a low-cost, effective, and permanent solution in bird control. The device prevents birds from landing or roosting, comes in 3-, 5- and 8-inch widths, is designed not to cut or injure the installer, carries a 10-year guarantee, and is virtually invisible when installed.